Our last couple of weeks in Goa were excellent. The friendships had developed so deeply and quickly and it was hard to say goodbye. The night before we left, we packed our jeep until there was just enough space for the girls. On the roof rack was a mattress, a metal trunk full of kitchen things, plastic buckets tied on, the girl’s little plastic table and chairs and our four different sized suitcases. Inside there was a guitar, more boxes, pillows, a few snacks and us. We left Goa at 3.30 am on the 21 March 1992. Our blue Gypsy was surrounded by lots of teary and blurry-eyed friends and neighbours who had come to say goodbye to us. Rosey and Melvin were there and so was Melba. Chuppa had been naughty once too many times and had been released into the trees. The girls missed saying goodbye to him. There was no sign of Shorty. It was too early for him. The plan was to leave before 4 am each day, which was the best way to avoid most of the traffic in the small towns and villages. We would drive for 7-8 hours, spend the afternoon and evening in a hotel and do the same thing the next day, until we got to Mussoorie. We worked out that it would take us under a week. Our route was Goa, Nasik, Indore, Agra, Delhi and finally Mussoorie. 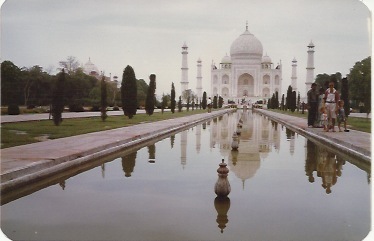 We stopped in Agra to see the Taj Mahal on the way. We were so exhausted, we couldn’t really appreciate the beauty or romance of it. Mussoorie was just one day away and we couldn’t wait to get there. Old Delhi was quite a place. We stayed with a pastor who Tony had met on his survey trip. Asha and Zoes had fun with his two little girls who were simliar ages. It wasn’t long after, that we heard he had been put in prison for misappropriation of funds. We were really sad. Asha and Zoes were such excellent travellers and our days of making them sleep anywhere really paid off. They spent their time entertaining each other on their “bed” at the back, in between sleeping and eating. We sung all the songs we could think of, teaching them harmonies and how to sing in rounds. We played I-spy and colours of cars. They made up a game that nearly drove us crazy. There were thousands of trucks we had to pass every day. Whenever we were stuck behind one, they would chant, “Truck, truck let us go, truck truck let us go.” They only stopped when we overtook and then started up with the next one. When they got bored of that game, they made a “NeeeeEEEEOwwwwww” sound every time a car past us. I wished I hadn’t taught them that one. Great Post around Indian Road Trip. It’s great to know that you enjoyed travelling through India.